“This is Captain Kirk,” professor Ian Bricknell said as he lifted the gecko from his enclosure. Twisting in Bricknell’s hand, the lizard gripped with his wide, flat toes and began crawling up the professor’s arm. The lizard measured about 10 inches from head to tail, and down each side ran a row of spines. The crested gecko is one of the best pets for people looking to get into reptiles, Bricknell said. They’re easy to handle. They don’t require special lighting. And they eat fruit-based smoothies not live insects. Ian Bricknell holds Captain Kirk, one of his crested geckos, on Aug. 22, at the University of Maine. Bricknell, a professor of aquaculture at UMaine, owns and breeds geckos, which he trades and sells each year at the Maine Herpetological Society Reptile Expo in Portland. 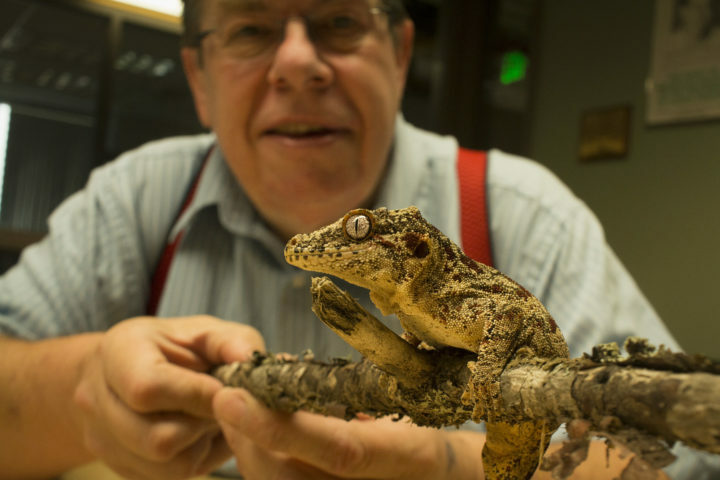 A professor of aquaculture at the University of Maine in Orono, Bricknell keeps and breeds geckos as a hobby. In his basement, also known as “the gecko room,” are dozens of terrariums filled with the lizards, which come in all shapes in sizes. At any one time, he’s breeding between 15 and 20 species. Ian Bricknell holds a two-week-old crested gecko on Aug. 22, at the University of Maine. 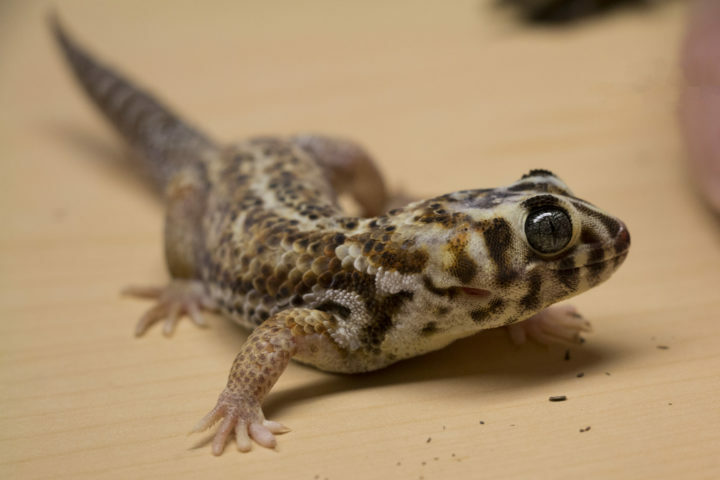 Bricknell, a professor of aquaculture at UMaine, owns and breeds geckos, which he trades and sells each year at the Maine Herpetological Society Reptile Expo in Portland. Bricknell attends the annual Maine Herpetological Society Reptile Expo, which this year is being held from 10 a.m. to 4 p.m. Sunday, Aug. 26, at the Doubletree by Hilton hotel in Portland. There he sets up a “Dr. B’s Geckos” table, mingles with fellow reptile enthusiasts and talks about some of his favorite creatures. As for variety — there are about 1,500 species of geckos, and they vary greatly in appearance, diet, habitat requirements and even temperament. And because each species of gecko is so different, it’s important for prospective gecko owners to do their research and pick the best species for them. 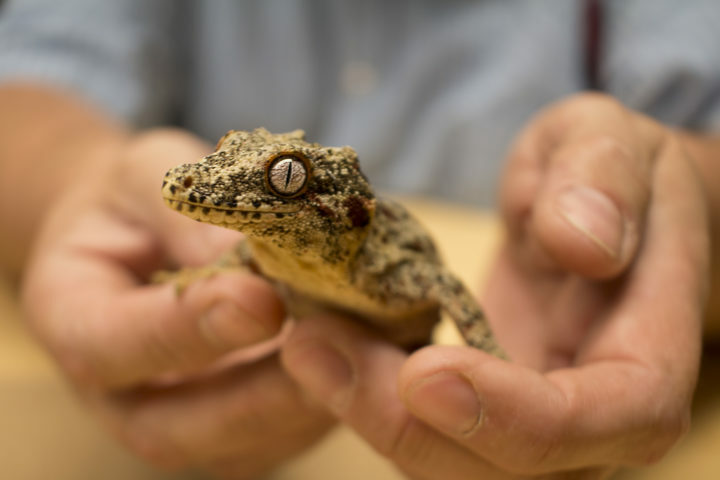 A frog-eyed gecko owned by Ian Bricknell, professor of aquaculture at the University of Maine in Orono, stands on a table during a demonstration. Bricknell owns and breeds geckos, which he trades and sells each year at the Maine Herpetological Society Reptile Expo in Portland. While some gecko species don’t need special lighting or temperature control in their terrariums, others do. Gecko diets can vary greatly, from live insects to salads and special powdered drinks. It’s important not to simply select a gecko based on its color or pattern. Though their beauty is one thing that makes them an attractive pet, selecting a lizard based solely on its looks may come back to bite you — literally. 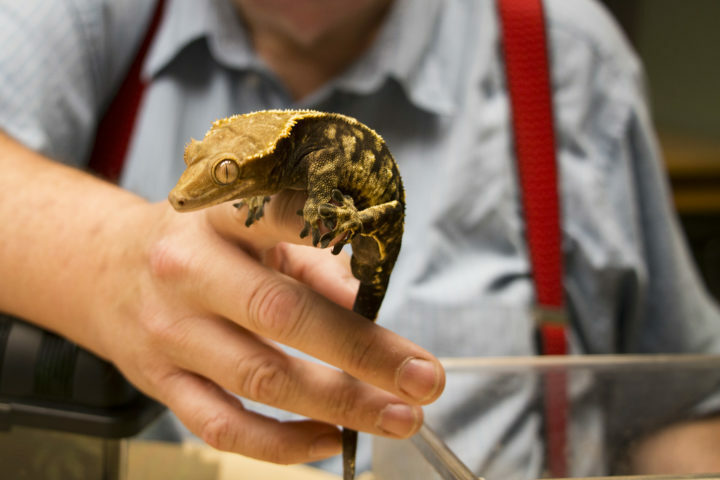 Ian Bricknell holds a New Caledonian giant gecko, the largest species of gecko in the world, on Aug. 22, at the University of Maine in Orono. 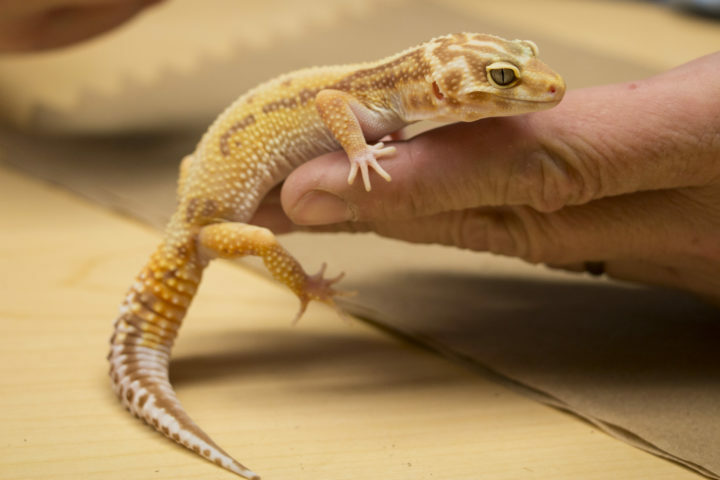 Bricknell, a professor of aquaculture biology in UMaine, owns and breeds geckos, which he trades and sells each year at the Maine Herpetological Society Reptile Expo in Portland. 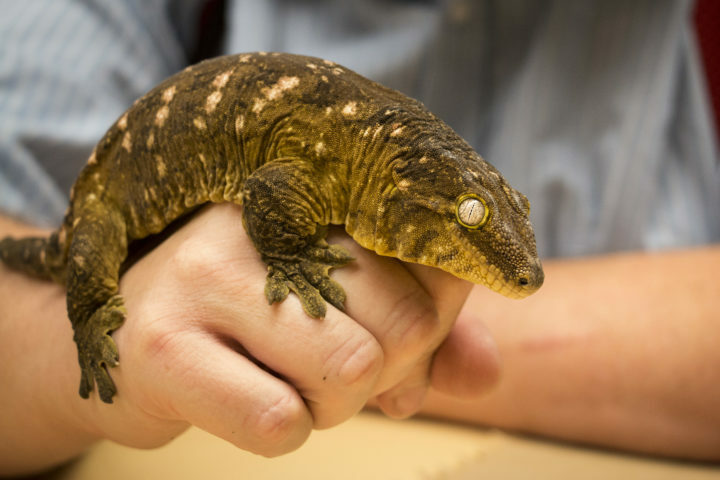 On the other hand, Bricknell has found the New Caledonian giant gecko — the largest gecko in the world — to be quite docile and friendly. 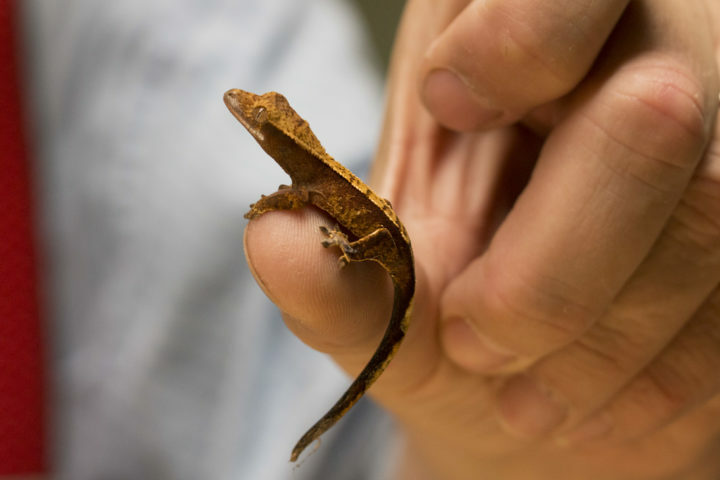 Costing about $1,000 per baby, this lizard can weigh between 8 to 10 ounces and hails from New Caledonia, an archipelago in the southwest Pacific Ocean. Bricknell owns three breeding pairs of these giant geckos, and he often uses them for educational demonstrations because they’re so good natured. But even among species, geckos have different personalities, Bricknell said. They also have different food preferences, right down to what flavor fruit smoothie they like best. Some like papaya, Bricknell said. Others prefer watermelon or apricot. Ian Bricknell holds one of his gargoyle geckos on Aug. 22, at the University of Maine, where Bricknell works as professor of aquaculture biology. As a hobby, Bricknell owns and breeds geckos. As Bricknell spoke, Captain Kirk snaked out his tongue and reached around his face to swipe over one of his large, sand-colored eyes. One distinctive characteristic of geckos is that they don’t have eyelids, so they use their long tongues to wash dust and debris from their eyes. Another interesting thing about geckos is that they use their long tails for signaling and communicating, and when threatened, they wag their tail from side to side to entice predators to latch on. Then, once captured, geckos can shed their tails and escape. And while most geckos can then grow back their tails, crested geckos like Captain Kirk cannot. In fact, for a long time, people thought crested lizards were simply tailless because they are so often seen without tails in the wild. Ian Bricknell holds a leopard gecko on Aug. 22, at the University of Maine. Bricknell, a professor of aquaculture at UMaine, owns and breeds geckos, which he trades and sells each year at the Maine Herpetological Society Reptile Expo in Portland. Another thing to consider when selecting a gecko pet is its activity level. While some are slow and easy to handle, others are born to run. And lastly, geckos vary drastically in life spans. While some only live for a few years, others can outlast the family dog. The crested gecko, for instance, has been known to live more than 20 years in captivity. So Captain Kirk, who Bricknell raised from the egg and is currently about five years old, will be around for years to come.